I’ve been recommending Dropbox for over two years now, and I’ve never had someone say that it wasn’t really helpful. 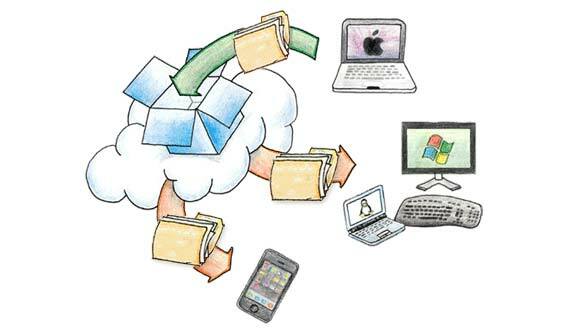 Dropbox is an essential tool for me and our entire ministry team at Shawnee. This week, I’d like to take a look at the reasons it’s fantastic, some tips for Dropbox users, small areas in which it’s lacking, and one big possible setback. We’ll start with why you have to download it today. I have many devices that sync with my Dropbox account- both work computers, my home computer, my wife’s iMac, my iPad, and my phone. I can send a flier design to my wife, put a picture on my phone, and show my pastor a design at lunch without ever connecting a cable or sending an email. All I do is move that file to the Dropbox folder. Dropbox supports selective sync, so I can choose which folders sync to which computers. This way I can share only neccessary files with my wife and not the massive design files I send to the print shop. This is the feature I love most. As I write this post, I have 13 shared folders in my Dropbox. Sharing folders is how I get a PowerPoint to the auditorium computer for the service without a flash drive, or send a huge PDF to our printing company, or upload the pictures I just took to the school yearbook staff. I don’t carry a flash drive anymore thanks to shared folders (but I do keep one at work as a backup). This is a recent feature that works wonders. Here’s an example: I just designed and sent a file to our church’s business administrator so he could have a fancy way to update offering total. He didn’t have Dropbox on the laptop he was using and was skeptical when I promised he could open the link I sent him (via dropbox.com). He clicked the link and it came right up. When he asked me to add a bit more information, I did it, saved the file, and told him to click the same link I sent earlier. Despite his recurring skepticism, he did and downloaded the updated file. Another great feature is dropbox.com. It’s where you can log in to see your files from any computer connected to the Internet. You can also create or make changes to shared folders, get more free space via referrals, rollback a file to a previous version up to 30 days old, and make use of the next tool we’ll talk about. This is a big feature a lot of people don’t know about. Deleted a file by mistake? Go online and get it back! Need to clear space so you can sync a large file? Just delete a few large files from your Dropbox to free up space then head online and re-download them later. You can do this by clicking “show deleted files” in the toolbar. As a warning, Dropbox only keeps your deleted files for 30 days, but if you need to temporarily free up space on your Dropbox quickly or you just accidentally deleted a file, know that Dropbox has you covered. The public folder is like a shared folder except instead of inviting users to see the whole folder, you get a link so you can share a file with anyone you want. Patrick Nix (from Partners for the Gospel) shared this neat idea that saves time if you post your bulletin, prayer sheet, or sermon outline on your site. Just save the file you’ll need to keep updating to your Public folder, grab the public link to put on your website, and make/save your changes as usual without changing the file name. Your file will be updated and ready for download, and you won’t have to use FTP or change the link through your web editor. Just be sure to use a generic file name like “bulletin.pdf” instead of “SundayAMBulletin_10302011.pdf”. Note: a relatively recent feature of Dropbox allows you to share any file from any folder, but we like to keep things simple here. You start with 2 gigabytes of storage space just for signing up. Use my referral link here and start off with an extra 500 megabytes. I’ll also cover how you can get more free space in my next post. For those of you still reading, stop and use this link to download Dropbox. For those of you who already have Dropbox, feel free to use the comments below to tell me about a great feature I missed. You may have the wonderful distinction of being the first to comment on this article.